Strike Alpha Cradle for Apple iPhone 8 with secure charging, antenna connection and pass through connector included. The connector cable used in this cradle is an authorised MADE FOR IPHONE Apple lightning cable. Packaged for a professional installation through your installer. Strike Alpha Cradle for Apple iPhone 8 DIY with secure charging, antenna connection and pass through connector included. The connector cable used in this cradle is an authorised MADE FOR IPHONE Apple lightning cable. DIY packaging for an easy Do It Yourself installation. 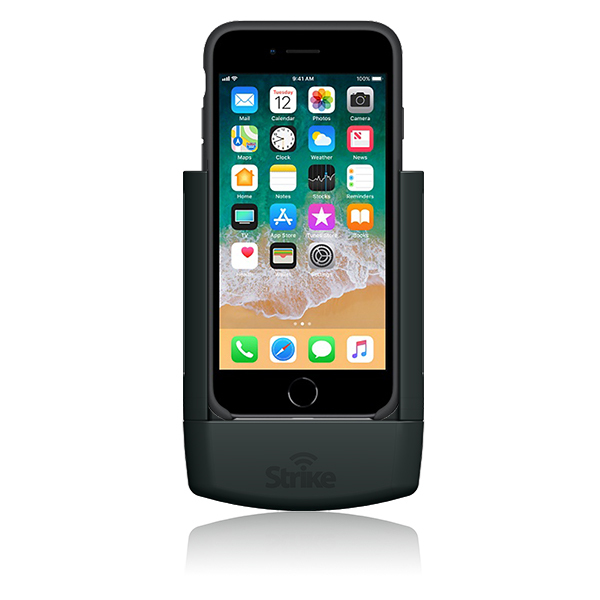 Strike Alpha Apple iPhone 8 for use with your Official Apple Leather and Silicon Cases - the only cradle that can be used with your iPhone case still on! Secure charging, antenna Connection and pass through connector included. The connector cable used in this cradle is an authorised MADE FOR IPHONE Apple lightning cable. Packaged for a professional installation through your installer. The Strike Alpha iPhone 8 cradle - the only cradle that can be used with your iPhone case still on! Secure charging, antenna Connection and pass through connector included. The connector cable used in this cradle is an authorised MADE FOR IPHONE Apple lightning cable. DIY packaging for an easy Do It Yourself installation. 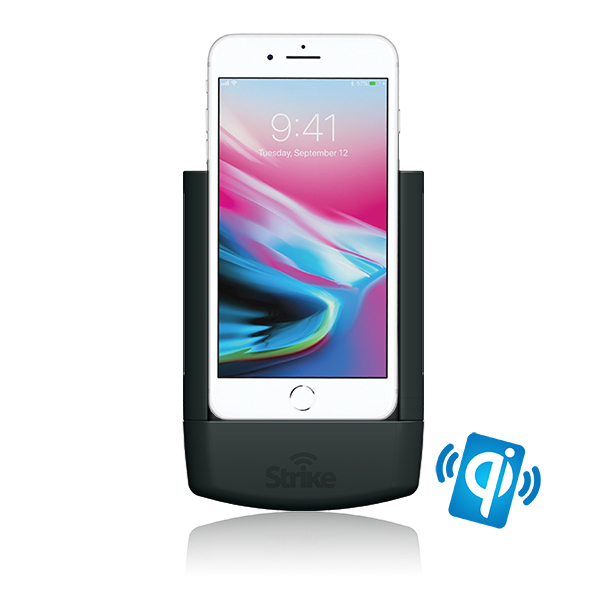 Strike Alpha Apple iPhone 8 Car Cradle with fast wireless charging capability and antenna connection. Packaged for a professional installation through your installer. 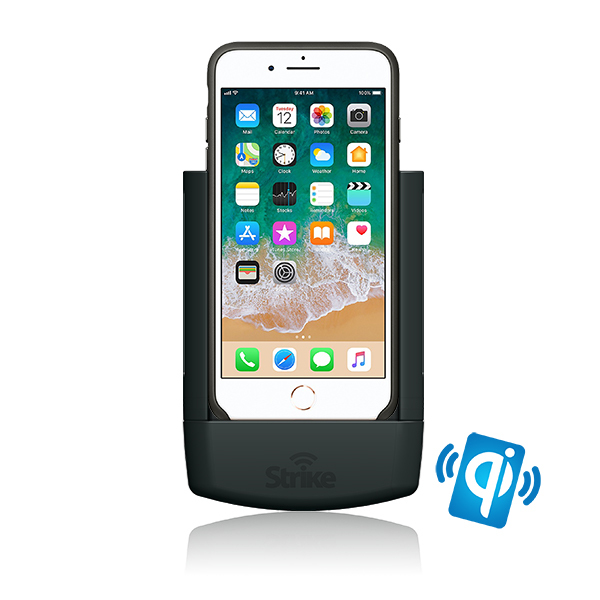 Strike Alpha Apple iPhone 8 Car Cradle with fast wireless charging capability and antenna connection. Packaged for a Do-It-Yourself installation. 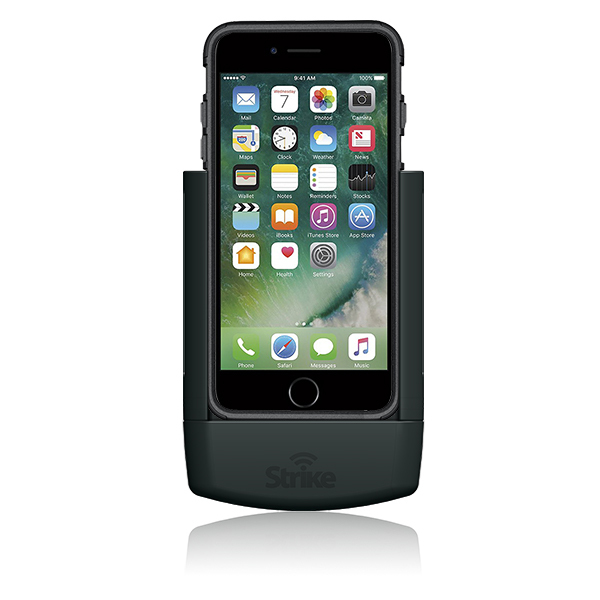 Strike Alpha Cradle for Apple iPhone 8 with Strike case - the only cradle that can be used with your iPhone 8 Strike case still on! Secure wireless charging, antenna connection and pass through connector included. The connector cable used in this cradle is an authorised MADE FOR IPHONE Apple lightning cable. Packaged for a professional installation through your installer. Strike Alpha Apple iPhone 8 Car Cradle for use with your Official Apple Leather and Silicon Cases - the only cradle that can be used with your iPhone case still on! With fast wireless charging capability and antenna connection. Packaged for a professional installation through your installer. Strike Alpha Apple iPhone 8 Car Cradle for use with your Official Apple Leather and Silicon Cases - the only cradle that can be used with your iPhone case still on! With fast wireless charging capability and antenna connection. Packaged for a Do-It-Yourself installation. 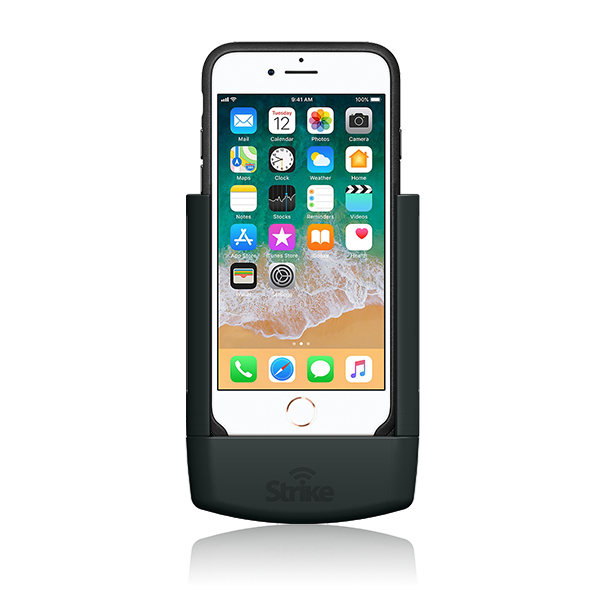 Strike Alpha Apple iPhone 8 Car Cradle for use with your Lifeproof Fre or Nuud Case - the only cradle that can be used with your case still on! With fast wireless charging capability and antenna connection. Packaged for a professional installation through your installer. 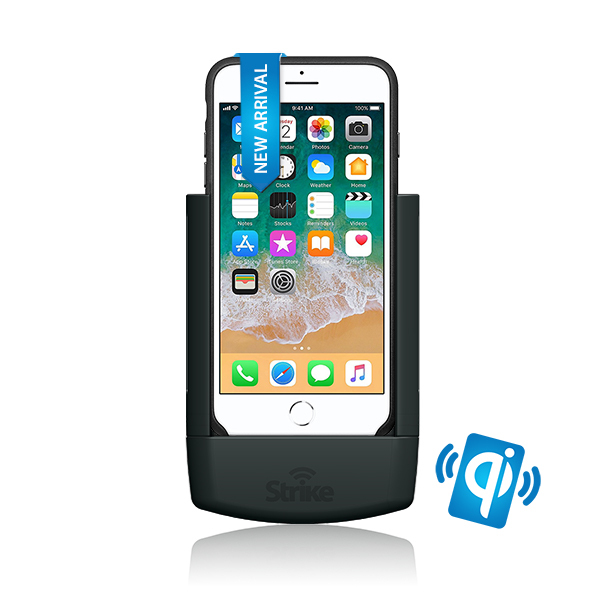 Strike Alpha Apple iPhone 8 Car Cradle for use with your Lifeproof Fre or Nuud Case - the only cradle that can be used with your case still on! With fast wireless charging capability and antenna connection. Packaged for a Do-It-Yourself installation. 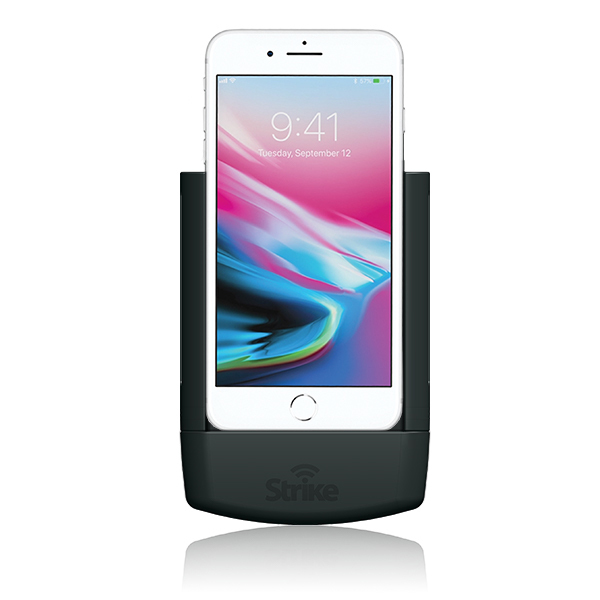 Strike Alpha Cradle for Apple iPhone 8 Plus with secure charging, antenna connection and pass through connector included. The connector cable used in this cradle is an authorised MADE FOR IPHONE Apple lightning cable. Packaged for a professional installation through your installer. Strike Alpha Cradle for Apple iPhone 8 Plus DIY with secure charging, antenna connection and pass through connector included. The connector cable used in this cradle is an authorised MADE FOR IPHONE Apple lightning cable. DIY packaging for an easy Do It Yourself installation. 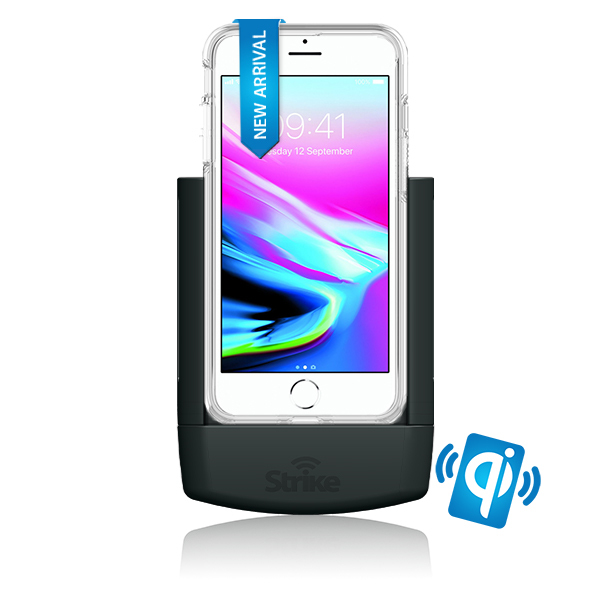 Strike Alpha Apple iPhone 8 Plus Car Cradle with fast wireless charging capability and antenna connection. Packaged for a professional installation through your installer. 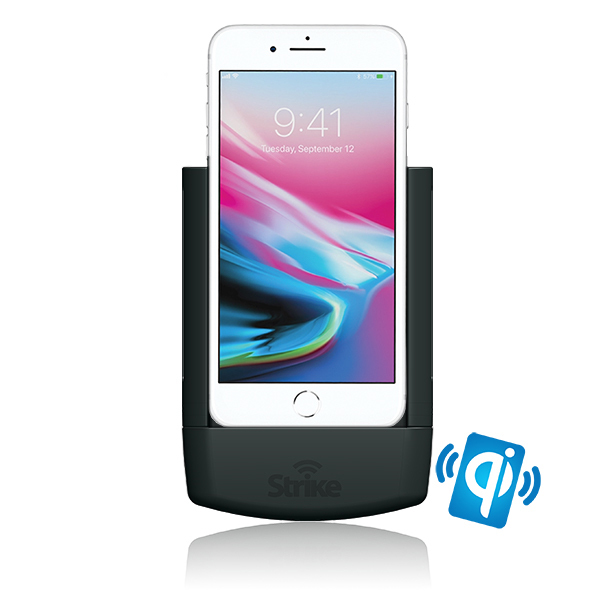 Strike Alpha Apple iPhone 8 Plus Car Cradle with fast wireless charging capability and antenna connection. Packaged for a Do-It-Yourself installation. Strike Alpha Apple iPhone 8 Plus Car Cradle for use with your Official Apple Leather and Silicon Cases - the only cradle that can be used with your iPhone case still on! With fast wireless charging capability and antenna connection. Packaged for a professional installation through your installer. Strike Alpha Apple iPhone 8 Plus Car Cradle for use with your Official Apple Leather and Silicon Cases - the only cradle that can be used with your iPhone case still on! With fast wireless charging capability and antenna connection. Packaged for a Do-It-Yourself installation. 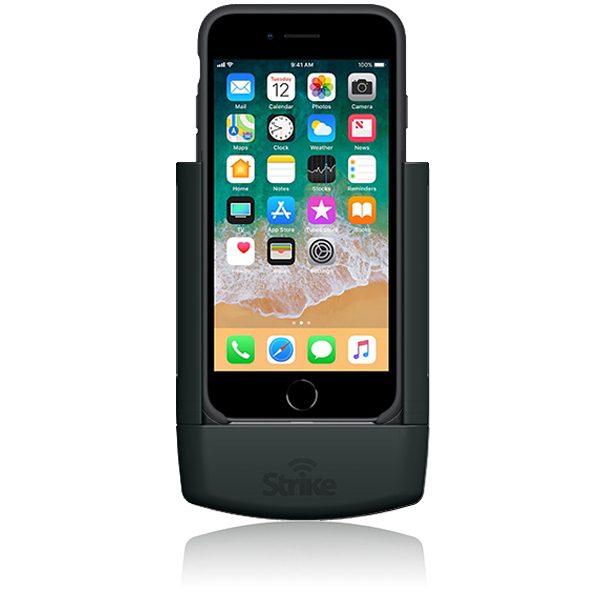 Strike Alpha Apple iPhone 8 Plus Car Cradle for use with your Lifeproof Fre or Nuud Case - the only cradle that can be used with your case still on! With fast wireless charging capability and antenna connection. Packaged for a professional installation through your installer. Strike Alpha Apple iPhone 8 Plus Car Cradle for use with your Lifeproof Fre or Nuud Case - the only cradle that can be used with your case still on! With fast wireless charging capability and antenna connection. Packaged for a Do-It-Yourself installation. Strike Alpha Cradle for Apple iPhone 7 & 8 - the only cradle that can be used with your Strike case still on! Secure charging, antenna Connection and pass through connector included. The connector cable used in this cradle is an authorised MADE FOR IPHONE Apple lightning cable. DIY packaging for an easy Do It Yourself installation. Strike Alpha Cradle for Apple iPhone 7 Plus & 8 Plus with case - the only cradle that can be used with your iPhone case still on! Secure charging, antenna connection and pass through connector included. The connector cable used in this cradle is an authorised MADE FOR IPHONE Apple lightning cable. Packaged for a professional installation through your installer. 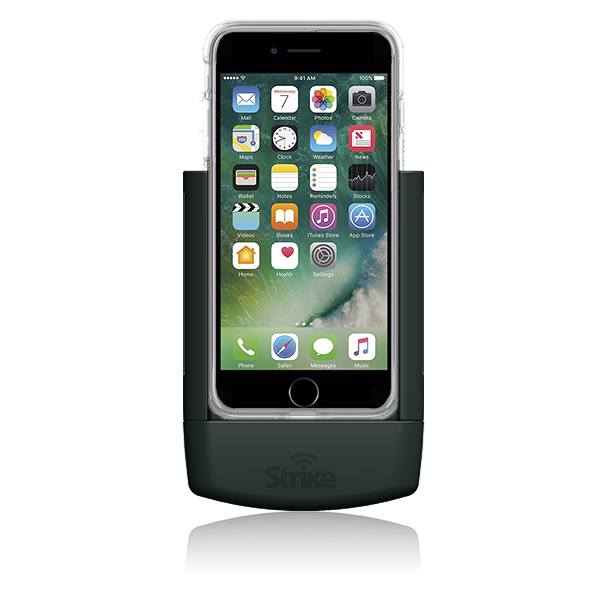 Strike Alpha Cradle for Apple iPhone 7 Plus & 8 Plus - the only cradle that can be used with your iPhone case still on! Secure charging, antenna connection and pass through connector included. The connector cable used in this cradle is an authorised MADE FOR IPHONE Apple lightning cable. DIY packaging for an easy Do It Yourself installation. Strike Alpha Cradle for Apple iPhone 7 & 8 - the only cradle that can be used with your Strike Rugged case still on! Secure charging, antenna connection and pass through connector included. The connector cable used in this cradle is an authorised MADE FOR IPHONE Apple lightning cable. Packaged for a professional installation through your installer. Strike Alpha Cradle for Apple iPhone 7 Plus & 8 Plus - the only cradle that can be used with your Strike Rugged case still on! Secure charging, antenna connection and pass through connector included. The connector cable used in this cradle is an authorised MADE FOR IPHONE Apple lightning cable.Packaged for a professional installation through your installer. Strike Alpha Cradle for Apple iPhone 7 Plus & 8 Plus - the only cradle that can be used with your Strike Rugged case still on! Secure charging, antenna connection and pass through connector included. The connector cable used in this cradle is an authorised MADE FOR IPHONE Apple lightning cable.Packaged for an easy do-it-yourself installation. Strike Alpha Apple iPhone 7 & 8 for use with your Official Apple Leather and Silicon Cases - the only cradle that can be used with your iPhone case still on! Secure charging, antenna Connection and pass through connector included. The connector cable used in this cradle is an authorised MADE FOR IPHONE Apple lightning cable. Packaged for a professional installation through your installer. The Strike Alpha iPhone 7 & 8 cradle - the only cradle that can be used with your iPhone case still on! Secure charging, antenna Connection and pass through connector included. The connector cable used in this cradle is an authorised MADE FOR IPHONE Apple lightning cable. DIY packaging for an easy Do It Yourself installation. Strike Alpha Cradle for Apple iPhone 7 Plus & 8 Plus for Official Apple Leather and Silicon cases - the only cradle that can be used with your iPhone case still on! Secure charging, antenna Connection and pass through connector included. The connector cable used in this cradle is an authorised MADE FOR IPHONE Apple lightning cable. Packaged for a professional installation through your installer. Strike Alpha Cradle for Apple iPhone 7 Plus & 8 Plus - the only cradle that can be used with your iPhone 7 Plus or 8 Plus Leather or Silicon case still on! Secure charging, antenna Connection and pass through connector included. The connector cable used in this cradle is an authorised MADE FOR IPHONE Apple lightning cable. DIY packaging for an easy Do It Yourself installation. Strike Alpha Cradle for Apple iPhone 7 or 8 - the only cradle that can be used with your LifeProof Fre or Nuud case still on! Secure charging, antenna connection and pass through connector included. The connector cable used in this cradle is an authorised MADE FOR IPHONE Apple lightning cable.Packaged for a professional installation through your installer. Strike Alpha Cradle for Apple iPhone 7 or 8 - the only cradle that can be used with your LifeProof Fre or Nuud case still on! Secure charging, antenna connection and pass through connector included. The connector cable used in this cradle is an authorised MADE FOR IPHONE Apple lightning cable. DIY packaging for an easy Do It Yourself installation. Strike Alpha Cradle for Apple iPhone 7 Plus or 8 Plus - the only cradle that can be used with your iPhone LifeProof Fre or Nuud case still on! Secure charging, antenna connection and pass through connector included. The connector cable used in this cradle is an authorised MADE FOR IPHONE Apple lightning cable. Packaged for a professional installation through your installer. 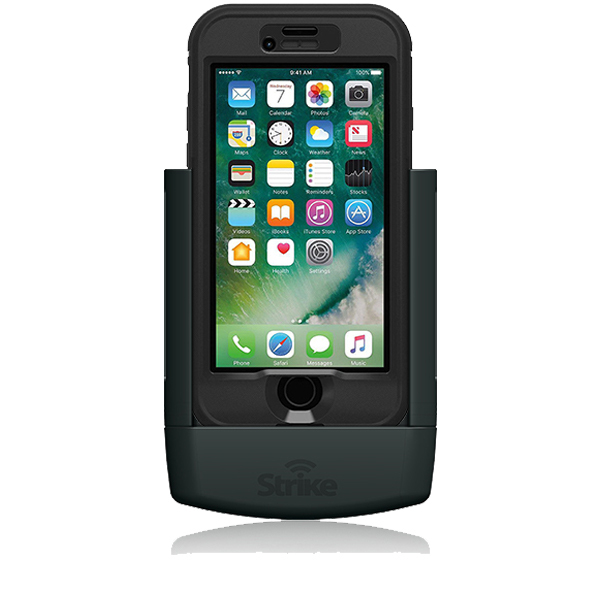 Strike Alpha Cradle for Apple iPhone 7 Plus or 8 Plus - the only cradle that can be used with your LifeProof Fre or Nuud case still on! Secure charging, antenna connection and pass through connector included. The connector cable used in this cradle is an authorised MADE FOR IPHONE Apple lightning cable. DIY packaging for an easy Do It Yourself installation. 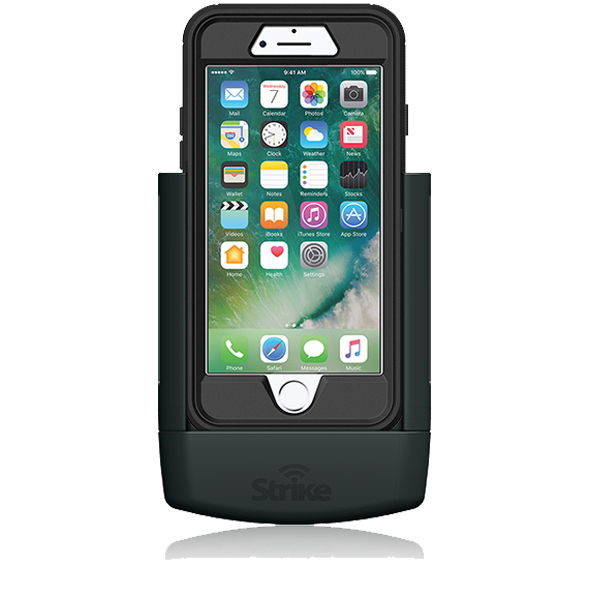 Strike Alpha Cradle for Apple iPhone 7 & 8 - the only cradle that can be used with your iPhone Otterbox-Defender case still on! Secure charging, antenna connection and pass through connector included. The connector cable used in this cradle is an authorised MADE FOR IPHONE Apple lightning cable. Packaged for a professional installation through your installer. 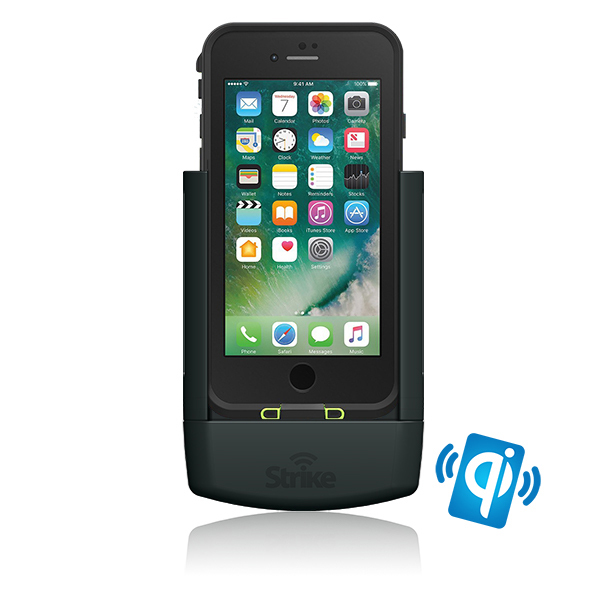 Strike Alpha Cradle for Apple iPhone 7 & 8 - the only cradle that can be used with your iPhone Otterbox Defender case still on! Secure charging, antenna connection and pass through connector included. The connector cable used in this cradle is an authorised MADE FOR IPHONE Apple lightning cable. DIY packaging for an easy Do It Yourself installation. 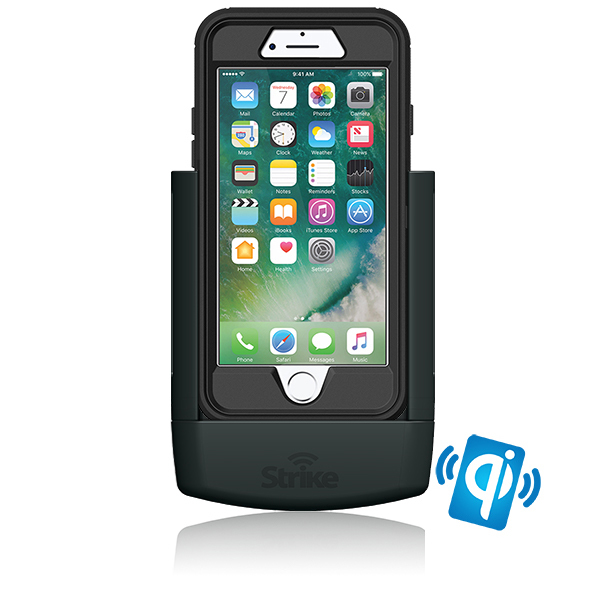 Strike Alpha Cradle for Apple iPhone 8 for Otterbox Defender case - the only cradle that can be used with your case still on! Secure charging, antenna Connection and pass through connector included. The connector cable used in this cradle is an authorised MADE FOR IPHONE Apple lightning cable. Packaged for a professional installation through your installer. 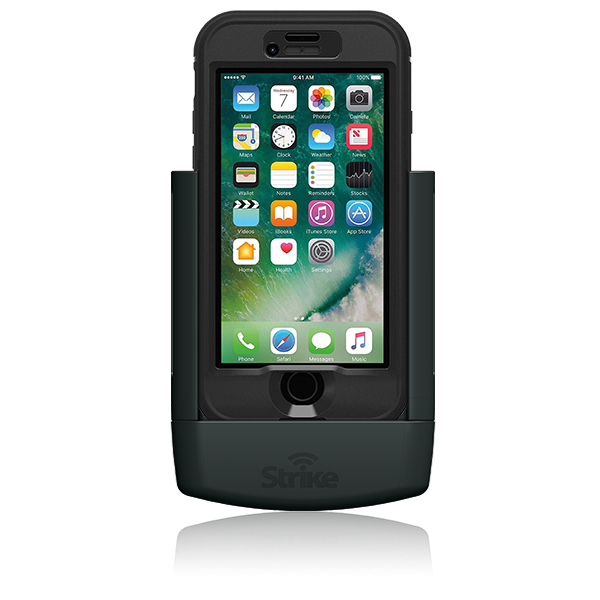 Strike Alpha Cradle for Apple iPhone 7 Plus & 8 Plus - the only cradle that can be used with your iPhone Otterbox Defender case still on! Secure charging, antenna connection and pass through connector included. Packaged for a professional installation through your installer. 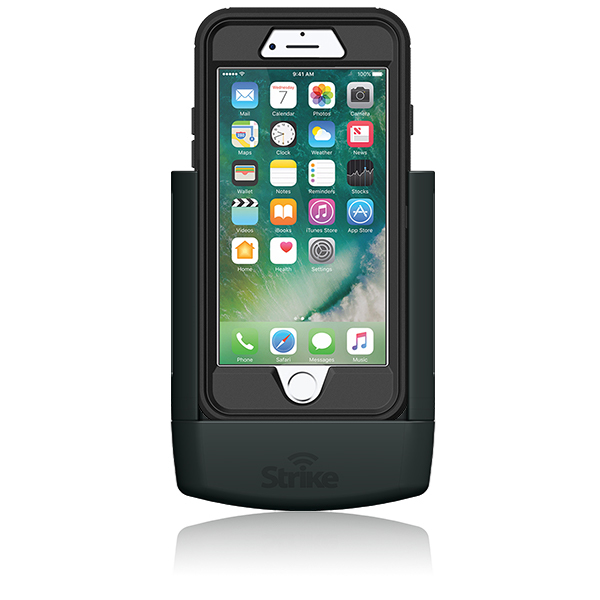 Strike Alpha Cradle for Apple iPhone 7 Plus & 8 Plus - the only cradle that can be used with your iPhone Otterbox Defender case still on! Secure charging, antenna connection and pass through connector included. The connector cable used in this cradle is an authorised MADE FOR IPHONE Apple lightning cable. DIY packaging for an easy Do It Yourself installation. We at Strike are pleased to present you with our newest range of phone holders for Apple's latest flagship smartphone, the iPhone 8! These car mobile phone holders for iPhone 8 & iPhone 8 Plus are now available at Strike. Each iPhone 8 car cradle comes in two versions, either professionally installed or Do-it-Yourself (DIY); specifically designed to suit your needs. The professionally installed car mounts come with a swivel mount and the DIY phone holders come with a windscreen mount. The Alpha iPhone car mount for iPhone 8 & iPhone 8 Plus have built-in Made-for-iPhone, Apple lightning charger, which ensures safe and fast charging for your smartphone. The car mobile phone holder features a built-in 12/24 volt charging system with voltage spike protection. Once docked onto a Strike Alpha Car Mobile Phone Holder, you are able now to use your favourite GPS applications, talk to a friend longer, or access your music playlist whilst on the road without worrying about extensive battery drainage. All of our Strike Alpha Car Phone Holders are fully compliant with Australian road laws; you are able to use your mobile devices while keeping your hands free, this minimises driver distraction. The unique pass-through feature allows the Alpha cradles to be integrated with another device such as Bluetooth car kits, entertainment system and even personal computers. This means you have the capacity to maximise your iPhone usage, whilst on the road safely and securely. And now you can even turn your iPhone into a Dash Cam when using our Strike Alpha DIY Car Cradle. This will save you money by removing the need to purchase or install stand-alone Dash Cams. Simply download a dash cam app*, customise your preferences, and then you can start recording your trips! Using your phone as a dash cam can protect yourself from insurance fraud or post-accident legal headaches. Let our cradles keep you & your device safe on the road. Start maximising your use of your iPhone with Strike's Alpha Cradle & Dash Cam 3 in 1 smarter solution: ‘Secure, Charge and Record’. 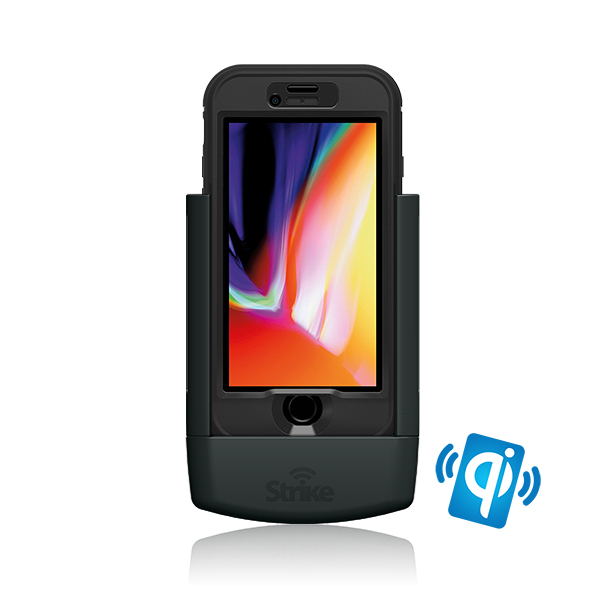 The Strike Alpha iPhone 8 and 8 Plus car mobile phone holders are made compatible with all networks including 700MHz 4GX for wider coverage and faster speed. We have a wide selection of Strike Antennas available. You can pair your Apple product with our Strike mounts to increase the range of your phone signal. Strike Antennas have been built to deliver high gain and reliable performance so whether you are in for a country or city drive, you know that you’re always connected.